Sarah met yoga over tea one morning years ago, and they hit it off famously. 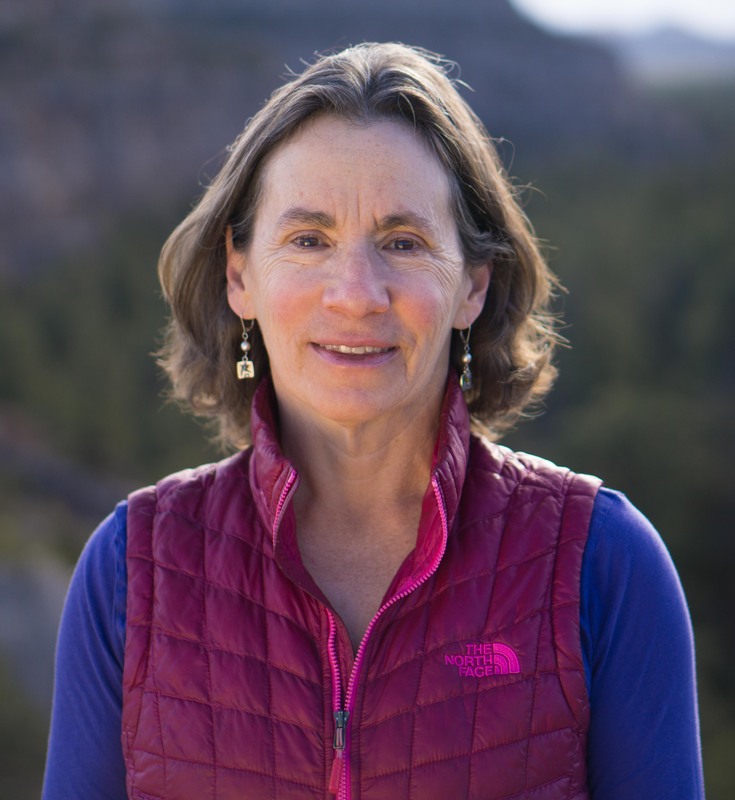 She began teaching in 2008, and currently offers public classes and private sessions to adults and children in Los Alamos, New Mexico. With a background in both biology and science writing, Sarah views yoga in part as a process of deciphering the stories encoded in our bodies. She encourages her students to explore their own somatic stories with a spirit of curiosity and appreciation. She also brings this narrative approach to her teaching, whether taking four-year olds on an adventure to outer-space or adults on a search for their psoas. A lifelong student, Sarah’s primary teachers are Tias and Surya Little, founders of Prajna Yoga, a world-renowned school that weaves asana, anatomy, and mindfulness training. 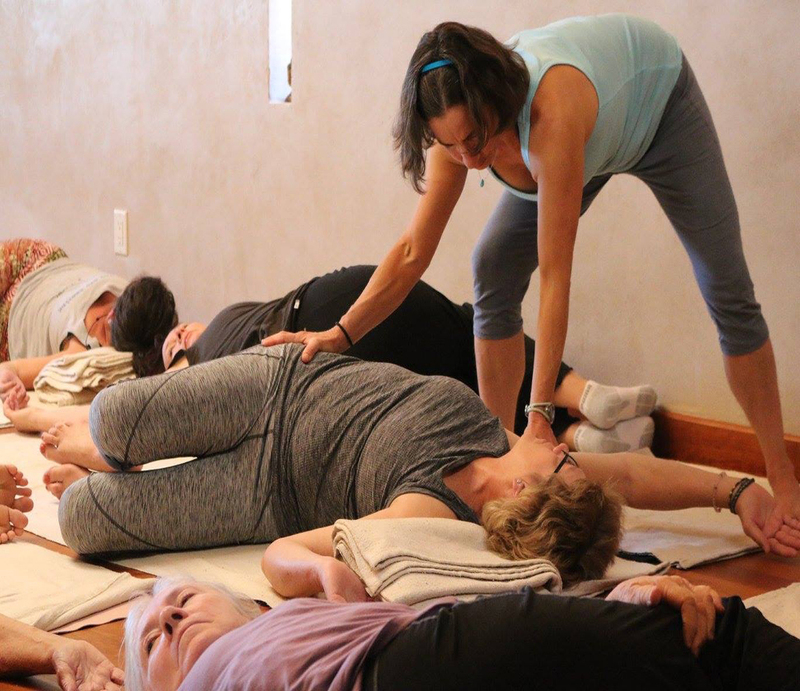 Sarah assists at Prajna Teacher Trainings and workshops in Santa Fe on a regular basis, and is one of the few instructors certified to teach Prajna’s SATYA movements. Sarah also trains in therapeutic yoga with Robin Rothenberg, and is certified to teach Robin’s highly effective Essential Low Back Program. When she’s not on the mat, Sarah’s probably outside growing food and flowers, hiking, or rock climbing with her husband and pugs. 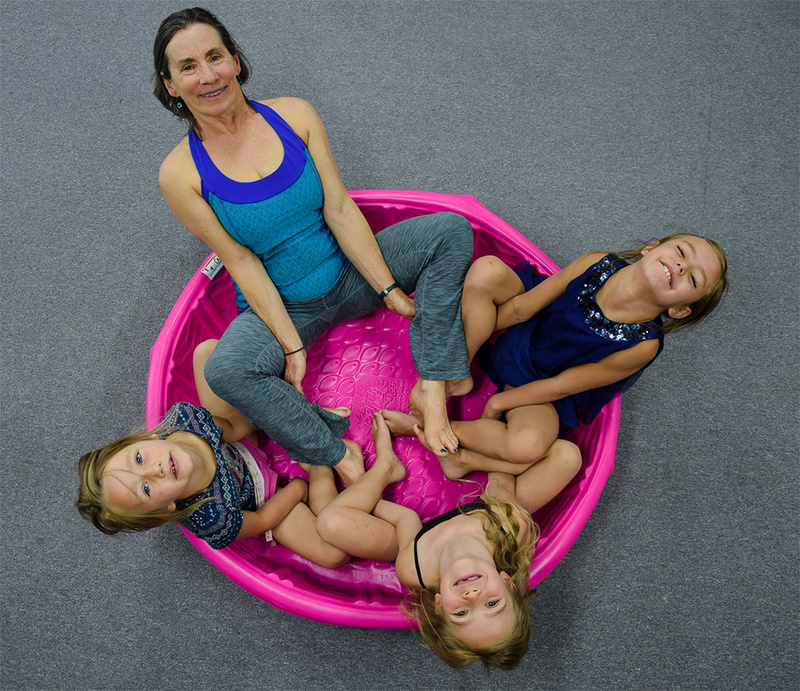 The mother of three adult children, Sarah’s yoga journey has always been a practice of crafting a constantly evolving balance between the various facets of a full and meaningful life. She strives to impart her passion for yoga by offering classes that are inclusive, inspiring, and playful. Reduce stress and increase energy while gaining strength, flexibility, and focus. Prajna Yoga integrates the outer practice of asana with deep insight into the inner experience. 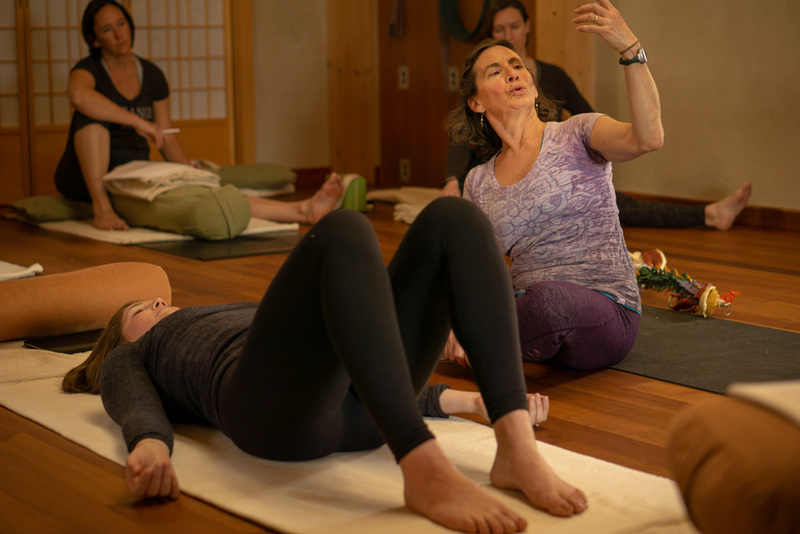 Sarah’s skillfully sequenced classes combine guided alignment and somatic awareness with breath-based movement to nourish and challenge students of all levels. Designed for ages 2-5 with an adult, Family Yoga weaves poses into story, song, and games to foster creative expression while developing focus, sensorimotor and self-calming skills. Sarah seeks to improve the overall health and well-being of her clients by offering personalized sessions that are integrative, educational, and rejuvenating. She often collaborates with local physical therapists and other body workers to facilitate patient recovery. You will never be on autopilot in a class led by Sarah. Her dedication to continuous learning and her ease with words make every class fresh: new material, new ways to illuminate asanas you thought you knew. She offers careful attention to each student, offering adjustments or suggestions that, while subtle, can result in great improvement in form. Yoga has changed my life by bringing greater peace and wellness into it. I started private lessons with Sarah after hip-replacement surgery a few years ago. Her expertise and individualized program is just what my body needs and wants. Sarah's teaching has greatly expanded my practice. Through her meticulous and generous approach, I have discovered new aspects of yoga. Her classes, often designed as guided explorations, encourage dialog and inquiry into mind-body awareness. Want to stay up to date with Two Pugs Yoga? Subscribe to the mailing list!